Available today is the 'zoom' variant of the latest Zenfone series. The Zenfone 3 Zoom comes with, well, you'd think a zoom lens (like in previous years), but a dual lens system, where one is 'normal' the other is 'wide'. The difference between the 2 they calculate as a 2.3x optical zoom. I'd prefer to have an actual zoom rocker, but I get that that would require to have a larger housing for it. And we've all kind of gotten used to the dual lenses on some of hte other phones out there that it's not weird at all. Phone runs at $329USD and is now widely available in the US. According to Newegg it should be available today in Canada and has a price tag of $480. Fremont, CA (May 9, 2017) -- ASUS today announced general availability of the ZenFone 3 Zoom. Built for photography, the ZenFone 3 Zoom is the world’s best camera smartphone with the longest battery life. The phone comes equipped with a best-in-class dual-camera system for photographic perfection and the world’s slimmest smartphone with a high-capacity 5000mAh battery. 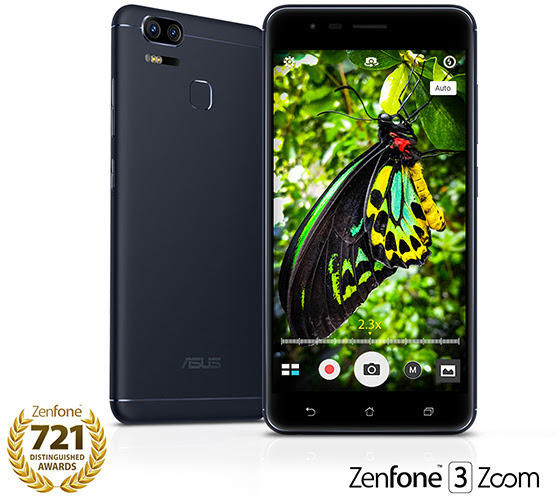 Today, the 5.5-inch unlocked Dual SIM ZenFone 3 Zoom, with AMOLED Gorilla Glass 5 display (1920 X 1080 FHD resolution), 3 GB of RAM and 32 GB of storage is available at the following online retailers for $329 USD: the ASUS store, Abt, Amazon, B&H, BestBuy.com, Fry’s Electronics, and Newegg. The ZenFone 3 Zoom is ASUS’ most accomplished camera smartphone to date, with new features designed to make it unrivalled in mobile photography. The ZenFone 3 Zoom’s innovative dual-camera system comprises a 12MP, f/1.7-aperture, 25mm wide-angle main lens and a dedicated 12MP, 59mm camera for instant 2.3X optical zoom. This setup ensures sharp focus for subjects at any distance. The new smartphone also introduces all-new Portrait mode, which rivals the depth-of-field effects achieved by professional DSLR cameras. The ZenFone 3 Zoom houses its incredibly high-capacity 5000mAh battery in a super-slim 0.31 in (7.9mm) full-metal chassis that weighs a mere 0.37 lbs (170g), making it the world’s thinnest and lightest 5.5-inch smartphone with a 5000mAh battery. At the ZenFone 3 Zoom’s heart is the powerful yet power-efficient Qualcomm® Snapdragon™ 625 processor, enabling the new smartphone to achieve an amazing 40 days of standby power on 4G¹. The capacious battery also gives the ZenFone 3 Zoom the ability to double up as a power bank to charge other devices. Dual-Camera System — The ZenFone 3 Zoom features an all-new dual-12MP, f/1.7-aperture, 25mm wide-angle main lens and a dedicated 12MP, 59mm camera for instant 2.3X optical zoom, enabling photographers to instantly use the best camera different subject types and focal lengths. SuperPixel Technology — The ZenFone 3 Zoom’s main camera is able to shoot incredibly fast and clear night or low light shots thanks to its new SuperPixel technology which increases light sensitivity dramatically. TriTech+ Autofocus — The ZenFone 3 Zoom has an improved TriTech+ autofocus system with Dual Pixel technology as one of its three focusing technologies. Dual Pixal AF gets its name from the two-phase detection sensors located on each pixel that can detect the movement of subjects by analyzing the variations between the light rays hitting the two sensors. RAW File Support (with Android 7.0 update) — The ZenFone 3 Zoom offers photographers the freedom to shoot and store compositions in RAW format. RAW files save the full data of the photo captured by the camera’s sensor and are ideal for enhancement with editing software, with much lower loss of image quality when compared to editing JPEG image files. Full Manual Mode – This mode enables full control over the ZenFone 3 Zoom’s extensive camera settings. These includes white balance, exposure value (EV), focus, and International Standards Organization (ISO) settings, and an impressive shutter-speed selection of between 1/50000 sec and 32 seconds. Full Manual Mode also allows users to override the automatic camera selection and choose to use either the 25mm, f/1.7 lens of the main camera or the 59mm lens of the zoom camera. High-resolution Selfies with Screen Flash – The ZenFone 3 Zoom features one of the highest-resolution front-facing cameras of any smartphone. The 13MP lens camera is not only able to shoot high-resolution selfies, it also features a new ‘screen flash’ mode that uses the display as a flash in low-light environments. Continuous Autofocus 4K Video Recording – The ZenFone 3 Zoom’s Dual Pixel system allows the smartphone to continuously focus on subjects while recording video at stunning 4K resolution, making it ideal for taking videos of moving subjects. ¹ Results achieved in a test facility with LTE data on, and WiFi, Bluetooth, GPS, and Near Field Communication (NFC) turned off. Ultra Large Battery, Ultra Small ChassisWith a charge rating of 5000mAh, the ZenFone 3 Zoom’s battery has one of the highest capacities of any smartphone — and the world’s highest capacity in its class but fits within the phone’s beautifully small, sandblasted aluminum-alloy body, which is a 0.31 in (7.9mm) thin and just 0.37 lbs (170g) in weight. This makes the ZenFone 3 Zoom the world’s slimmest 5000mAh smartphone, giving users an amazingly long 40-day standby on 4G or 6.4 hours of non-stop 4K video shooting with minimal additional weight. The high-capacity battery also complements the ZenFone 3 Zoom’s photographic capability by allowing users to shoot for longer periods of time and allows for battery intensive operations like time-lapse photography to be done without worrying about running out of charge. The ZenFone 3 Zoom’s high battery capacity also lets it double up as a power bank for charging other devices via an automated reverse-charging capability. The ZenFone 3 Zoom’s display is a 5.5-inch Full HD AMOLED panel that renders images with extreme clarity and contrast. It is protected by the latest Corning ® Gorilla® Glass 5 that is 70% more resistant to drop damage compared to the previous Gorilla Glass generation. AVAILABILITY AND PRICINGThe 5.5-inch unlocked Dual SIM ZenFone 3 Zoom, with AMOLED Gorilla Glass 5 display (1920 X 1080 FHD resolution), 3 GB of RAM and 32 GB of storage is available at the following online retailers for $329 USD: the ASUS store, Abt, Amazon, B&H, BestBuy.com, Fry’s Electronics, and Newegg. The ZenFone 3 Zoom will also be available in-store at select retail locations starting today, and at select Best Buy locations on May 28. Please contact ASUS for more details.